Some features that use mailing addresses, like postcards or segmentation, require you to format your contacts’ address data a certain way in your list. If an address isn’t formatted correctly, our system won’t recognize it. In this article, you’ll learn how to verify that a contact’s mailing address is formatted correctly, and what steps to take if it’s not. Here are some things you should know about formatting addresses to use with Mailchimp features. This article is for users who already have contacts with address data in their list. If you still need to import your contacts, check out Format Guidelines for Your Import File and Import Mailing Addresses for Postcards. When you create a new list, it automatically includes an address field that’s designed to store each contact’s complete mailing address. This field is hidden from signup forms, but you can make it visible if you want to collect address data from new subscribers. We automatically format mailing addresses that you collect with your signup form or connected e-commerce store. But if you’ve imported your contacts and their data, we suggest you verify that their addresses are ready to use with our features. There are a couple ways to check for proper address field formatting. If you only need to review a few addresses, you can look at them one-by-one in individual contact profiles. If you need to verify many addresses, it may be easier to export and review them together. First, make sure your addresses are correctly stored in your list. 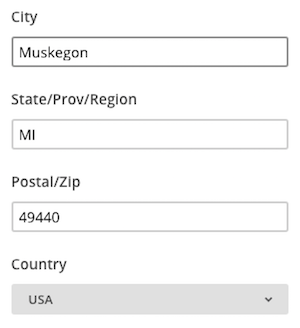 Each address, including the country and zip code, must be contained in a single list field. The field must be a designated address field, not a text field, and the associated merge tag must be ADDRESS. To review your address field settings, follow these steps. Verify that each contacts’ entire address is contained in a single list field. Click the Settings drop-down menu and choose List Fields & Merge Tags. Find the address field and confirm that the designated field type is address. Confirm that the associated merge tag is ADDRESS. If you store more than one address for each contact, only use this merge field name for the address field you want to use for postcards. To check whether a contact’s address field information is properly formatted in your list, follow these steps. Click a contact to view their address data. In the Profile Information section, click Edit. In the Edit Profile pop-up modal, confirm that each part of the contact’s address is displayed in the correct field. If the address fields are empty, or if certain information is in the wrong field, we can’t use it with our features. Our export process relies on proper address formatting, so an easy way to identify errors is to export your contacts and review the addresses in the CSV file. When mailing addresses aren’t formatted correctly, our import tool inserts “US” as the default value. To check the formatting of all of the addresses in your list, follow these steps. To export a segment, click View Saved Segments, choose the segment you want to export, then click Export Segment. Next, you’ll fix the incorrectly formatted addresses and auto-update your list. If your export reveals formatting issues with multiple addresses in your list, you can use the auto-update import feature to fix all of them at once. First, you’ll open your original import file or new export file in a spreadsheet program. Then, you’ll follow our formatting guidelines to create or edit the address column or columns. Lastly, you’ll use your edited file to auto-update your list. The way you'll format and import your contacts' mailing addresses depends on whether they're stored in a single column or multiple columns in your file. To learn more, check out Import Mailing Addresses for Postcards. Auto-update replaces list field information with information from your import file, so you can quickly update information for multiple contacts at once. To auto-update a list, you’ll follow the usual import process, then check the box next to Auto-update my existing list on the final step. Before you auto-update, verify that your import column names match your Mailchimp list field names and that no fields are blank. Blank fields can overwrite existing contact data.